Addiscombe is an area of South London which lies within the London Borough of Croydon. It is located to the northeast of Croydon and is home to London commuters. 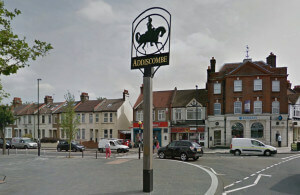 Addiscombe can be reached by car via the A232. Addiscombe has good public transport and East Croydon railway station is a busy hub with frequent services to London. Lanes School of Driving was established in 1914. Instructors at Lanes have taught many generations of locals to drive and today Lanes has an excellent reputation for quality instruction. At Lanes we regard each of our pupils as having different needs, and our courses are carefully calibrated to suit each individual. Our intensive driving courses are a popular option for those who want to progress fast. Theory lessons can be either incorporated into practical lessons or taught separately. Our pupils have the option of further instruction after passing their driving test. A range of after pass courses are available including: Parking Skills, Advanced Driving, Pass Plus and Motorway Driving. Pupils often have hectic schedules. At Lanes, pupils can timetable their lessons for a time convenient for them. Lessons are offered either as part of a weekly course, or as single lessons. Lanes is committed to offering all pupils one on one instruction. We find that this ensures that each pupil is guaranteed the full attention of their instructor, allowing faster progress. Lanes has a range of top models for our pupils to drive. Lanes can collect pupils prior to their lesson and drop them back home at the end of the lesson. Lanes have been providing driving lessons in Addiscombe, Surrey for many years. Please call us today on 020 8166 5678 or click here to send us an email via the contact page. Lanes has 40 experienced driving instructors on call. Pupils are free to choose the instructor that best meets their requirements. A wide range of ages have learnt to drive with our instructors; from 17 to over 70. Do not worry if you are nervous; our instructors will be on hand to guide you. All of Lanes’ instructors are qualified as an Approved Driving Instructor and registered with the DSA. Pupils will retain the same instructor for all their lessons to ensure the teaching is focussed on their individual needs. Lanes have a team of driving instructors in Addiscombe, Surrey. Please call us today on 020 8166 5678 or click here to send us an email via the contact page. Learning to drive can be nerve-wracking for the beginner. It is not unusual for female pupils to express reluctance to have to learn with a male instructor. At Lanes we recognise this and allow pupils to select from one of our female instructors. Female driving instructors at Lanes are kind and sympathetic. This ensures that their pupils feel relaxed and calm during their lessons. Lanes have a selection of female driving instructors in Addiscombe, Surrey. Please call us today on 020 8166 5678 or click here to send us an email via the contact page. Some of our pupils prefer to learn in an automatic car. Manual cars do allow drivers with more control over their vehicle. But many beginners feel daunted by having to change gears manually. Automatic cars are far less complicated to drive and they cannot be stalled. Pupils who choose automatic cars can often learn faster. Lanes have a selection of automatic driving instructors in Addiscombe, Surrey. Please call us today on 020 8166 5678 or click here to send us an email via the contact page.